“Bathing friends are the best of friends” is a Japanese saying. Social bathing has been around for thousands of years and is inseparable from the history of human cultures. 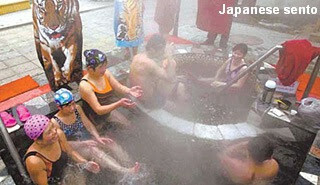 From the North American sweat lodge to Japanese sentos, European hot springs, Finnish saunas, Turkish hammams, Russian banyas or Korean jjimjilbangs, these public bathing rituals are integral to the lives and customs of its people. In many countries, social bathing is the proper way to welcome a foreign guest, begin a first date or meet up with family and friends. You can discover so much about a city and its people by visiting their public baths. Not sampling the local bathing culture is like not sampling the local cuisine. You may be apprehensive about the rules, etiquette or rituals, but being befuddled in another culture is part of the experience of getting to know the customs and lives of its people. So the next time you are traveling, visit the local baths or thermal waters. In the end you will get to experience some local flavour, enjoy the health benefits and be part of an age-old tradition of social bathing.